This is Wendy. Here's my string top for the Presidents' Day Challenge. 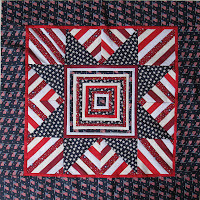 It was quite fun to put together and I have tons of scraps from it to put into a patriotic star quilt or something. Tx for the challenge, I might not have gotten around to this one otherwise! Super Terrific Quilt!! I wonder if any others are going to "Take the Challenge". That is a beautiful string star quilt.